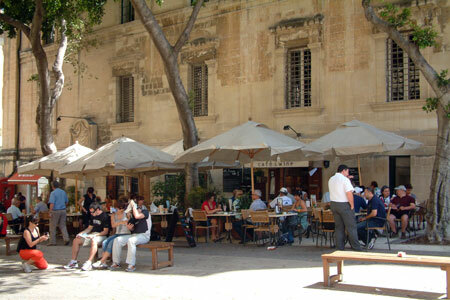 There are lots of places to eat in Valletta ranging from street vendors and fast food establishements, pavement cafes to high class restaurants. If you would like a budget place to eat or for a quick snack, the Pizzlandia fast food outlet in Republic Square, in the centre of Valletta, is very good. 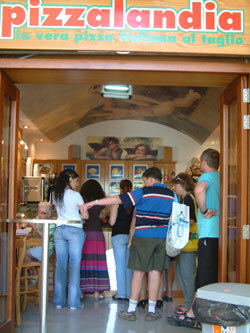 They have ready prepared slices of pizza, salads, pasta dishes and soft drinks (all at 1 euro each in June 2009). The locals use this takeaway for lunches which is a good recommendation. There are just a handful of tables and chairs to eat outside beside Eddie's Cafe, a much larger cafe with waiter service. British style pubs don't really exist in Valletta despite red post boxes and public telephones. They have their own fairly basic pubs mainly frequented by men. There is a Burger King near the city gate.